The move comes as the sustainability of MoviePass' business model comes into question. Because MoviePass is paying most theaters the full price of the ticket, the service loses money with just one or two movies in a month. The average ticket price in the U.S. is about $9, though $15 and up is common in big cities. 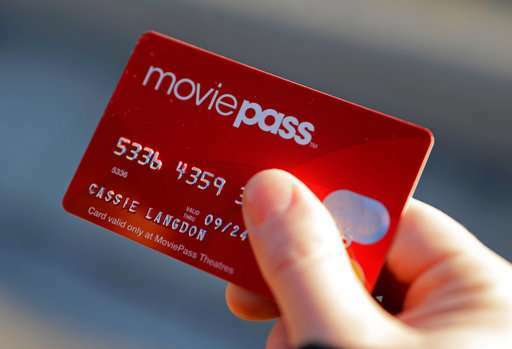 MoviePass regularly changes its promotions and rates, and it's not clear whether the one-movie-a-day deal will return. It appears customers who have already paid under the old plans aren't affected, but it's not known whether they would be able to renew under the more generous terms. MoviePass would say only that it is "continually testing various promotions." The service's movie-a-day deal was popular among moviegoers, many of whom were seeing more movies at theaters than they normally would have. Without MoviePass, going to the movies was worth it only a few times a year for many people. Ticket prices keep rising, and moviegoers have plenty of cheaper alternatives, including Netflix. But the service also has struck a nerve with the movie industry. Adam Aron, CEO of the giant theater chain AMC, has called MoviePass' price "unsustainable." AMC initially threatened legal action, but seems to have backed off. MoviePass wants to work out ticket discounts and revenue-sharing deals with theaters on the premise that it's driving more people to theaters. The company is also eyeing a share of concession sales, saying moviegoers are more willing to buy popcorn and soda when scoring a "free" movie. But theaters have balked at offering MoviePass anything. MoviePass' parent company, Helios and Matheson Analytics, has warned in a financial report that MoviePass' future is in "substantial doubt" because it "has incurred losses since its inception and has a present need for additional funding."